"Be stunned and amazed, blind yourselves and be sightless; be drunk, but not from wine, stagger, but not from beer. The Lord has brought over you a deep sleep: He has sealed your eyes (the prophets); he has covered your heads (the seers). For you this whole vision is nothing but words sealed in a scroll. ...In that day the deaf will hear the words of the scroll, and out of gloom and darkness the eyes of the blind will see. Once more the humble will rejoice in the Lord; the needy will rejoice in the Holy One of Israel." 29:9 Literal Hebrew says, “stupefy yourselves and be in a stupor”. Calvin says: “tarry and wonder” Rotherham says: “stand ye stock still and stare.” The point is that Isaiah is telling them to think real hard and try to figure out what he is saying. But, mockingly, they will never figure out his message because of their rebellion. The main problem with Jerusalem is that the spiritual and moral leaders are so blind by their own traditional religious system that they can not even understand God’s revelation if it were written down. The prophets and the seers do not understand what God is saying nor can anyone read and understand the words of the prophets or of the Law. Jerusalem rejected the revelation that they understood. If people see the will of God and refuse to do it they will become incapable of seeing and doing any further thing God has revealed. As a result of this they will be spiritually blinded from understanding anything further. If you reject known spiritual truths, you will be cut off by God in the future from understanding other truth. This would result in Jerusalem slipping further and further away from God and into judgment. Intentional resistance and rebellion to God results in being left in the darkness of the soul. In this condition a person will act out the darkness that is in them which will ultimately destroy their life and demand God's judgment. Go and tell this people: ‘Be ever hearing, but never understanding; be ever seeing, but never perceiving. Make the heart of his people calloused; make their ears dull and close their eyes. Revelation has been cut off. The people chose not to obey God, now they do not even remember. No one will be able to speak and explain the word of God. 29:11-12 Those who are trained and can read can not understand it. Those who are not trained can't even read it. The idea communicated here is that people are without hope in this culture because the trained religious leaders are too “drunk” on religion to understand revelation. This leaves the discovery of the revelation to the untrained who can not even read it naturally let alone interpret it. Notice that the scrolls and the doctrine is still there, it just can not be understood. 29:13 Because they do not understand the revelation they must reduce it to rules and regulations. They turn it into a religion. Faith is seen here as a soft heart determined to respond and follow God. Not rules and regulations that are used to replace relationship and righteousness. 29:14 Because they are so dull spiritually that they cannot hear the prophet and they can not read the scriptures, God will have to shock them into understanding like he did when he brought them out of Egypt. God will work a wonder. The Lord will upset any image they have of him fitting into their religious box. Throughout church history and in many countries God has exploded on the scene with a novel and amazing work without contradicting his word and character. But, also without consulting the local religious institutions! Dichazo (Gr) – variance (Eng) – the Greek word dichazo means “to cut apart” and “to divide in two.” Dichazo is used in Matthew 10:35. I will respond to God and not neglect what I know is right. I will use what God has given me and not be careless with my responsibilities. 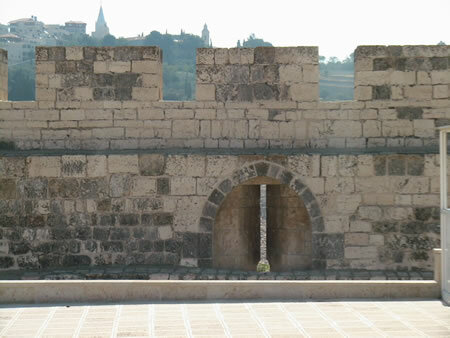 An arrow loop as viewed from the outside of the walls of Jerusalem. 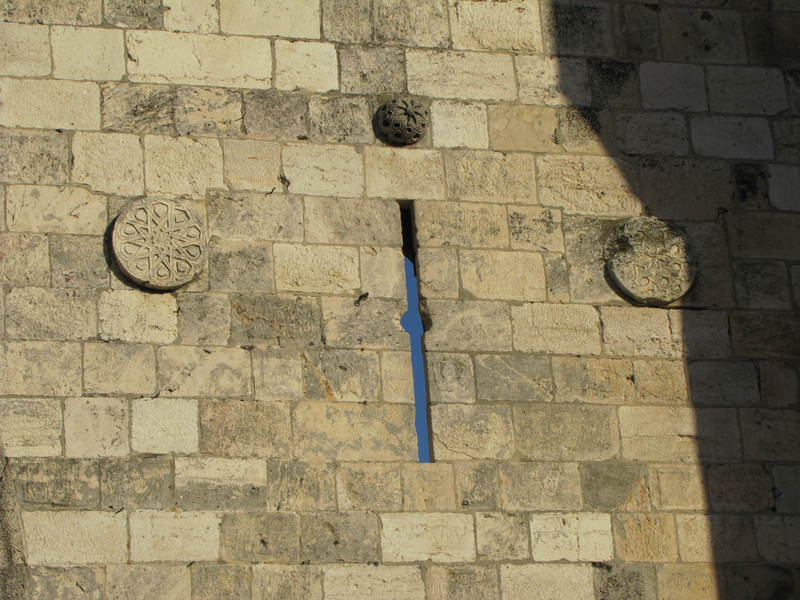 Archers would shoot arrows through this slot from the other side of the wall. See the inside view of an arrow loop. Look through an arrow loop from the Temple Mount into thd Kidron Valley. 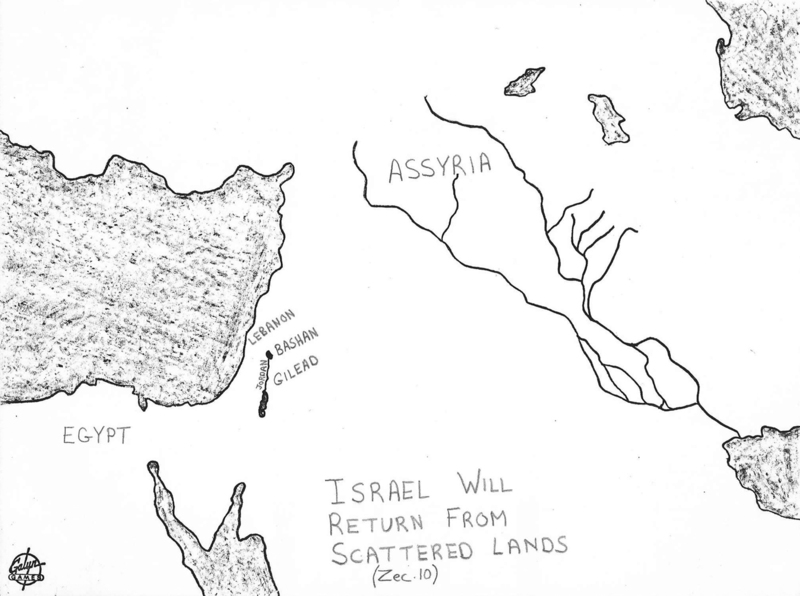 Zechariah 10 detailed on a map. "We fear men so much, because we fear God so little." but he who hardens his heart falls into trouble." Hear us, Shepherd of Israel, you who lead Joseph like a flock. You who sit enthroned between the cherubim, shine forth 2 before Ephraim, Benjamin and Manasseh. Awaken your might; come and save us. You have made us an object of derision[b] to our neighbors, and our enemies mock us. Restore us, God Almighty; make your face shine on us, that we may be saved. the root your right hand has planted, the son[e] you have raised up for yourself. He struck down the firstborn of Egypt, the firstborn of people and animals. He sent his signs and wonders into your midst, Egypt, against Pharaoh and all his servants. Your name, Lord, endures forever, your renown, Lord, through all generations. The idols of the nations are silver and gold, made by human hands. house of Levi, praise the Lord; you who fear him, praise the Lord.